Advances in financial technology are changing market and regulatory ecosystems in ways unimaginable a generation ago. These new developments offer exciting opportunities as well as enormous challenges — and Georgetown Law’s Institute of International Economic Law is leading the way in fostering the discussions. 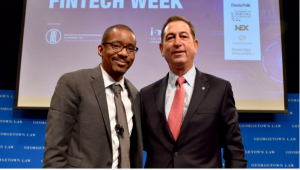 Fintech Week, held at Georgetown Law and in Washington, D.C., November 5 to 8, featured multidisciplinary sessions with many of the world’s top fintech experts. In Hart Auditorium, Professor Chris Brummer, IIEL’s faculty director, interviewed a number of regulatory agency leaders including William Hinman, director of the U.S. Securities and Exchange Commission’s Division of Corporate Finance; Sheila C. Bair, former chair of the U.S. Federal Deposit Insurance Corporation; Craig S. Phillips, counsel to the secretary of the Treasury; Joseph M. Otting, Comptroller of the Currency; Pradeep Belur, chief of staff and chief operating officer at the U.S. Small Business Administration; and J. Christopher Giancarlo, chair of the U.S. Commodity Futures Trading Commission.